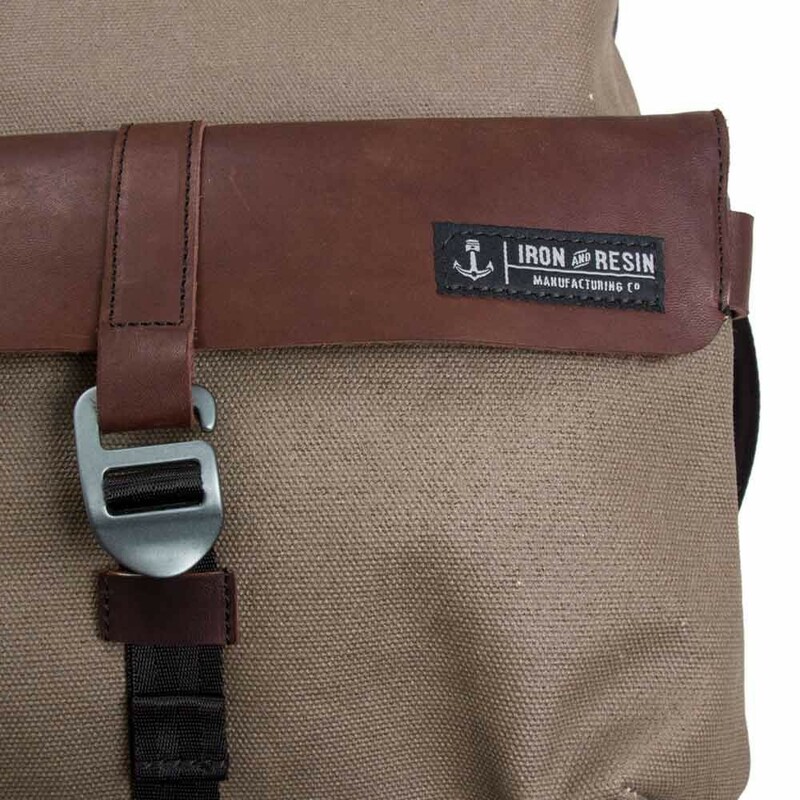 The Iron and Resin Terrain II Pannier Bag is a durable and robust bike pannier designed to fit most vintage and modern motorcycles, makes and models. 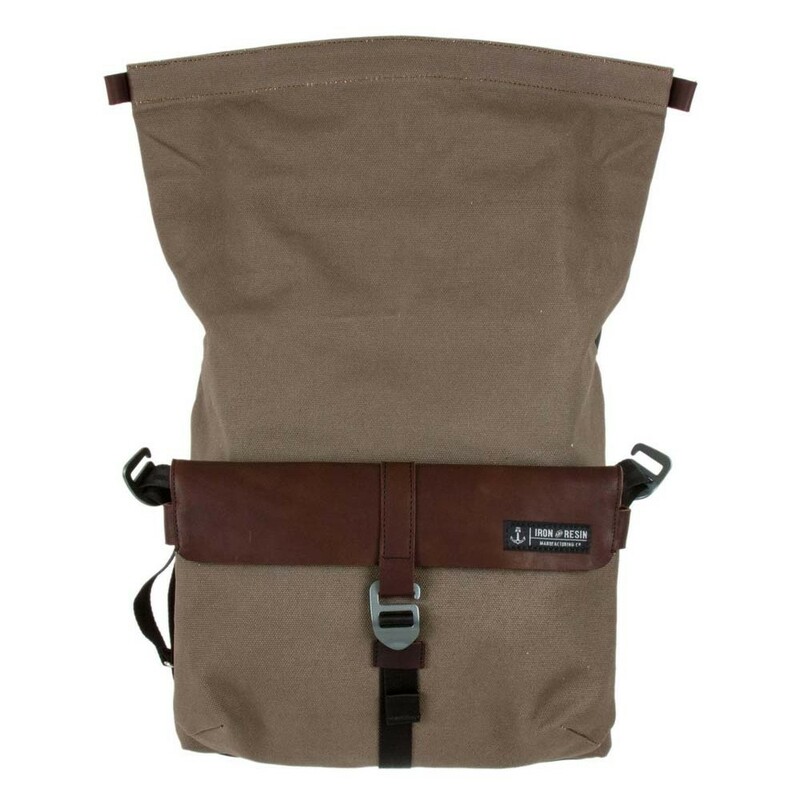 Constructed from durable 100% cotton canvas with a polyurethane water-resistant coating, the pannier also features a large exterior pocket (ideal for tools etc.) 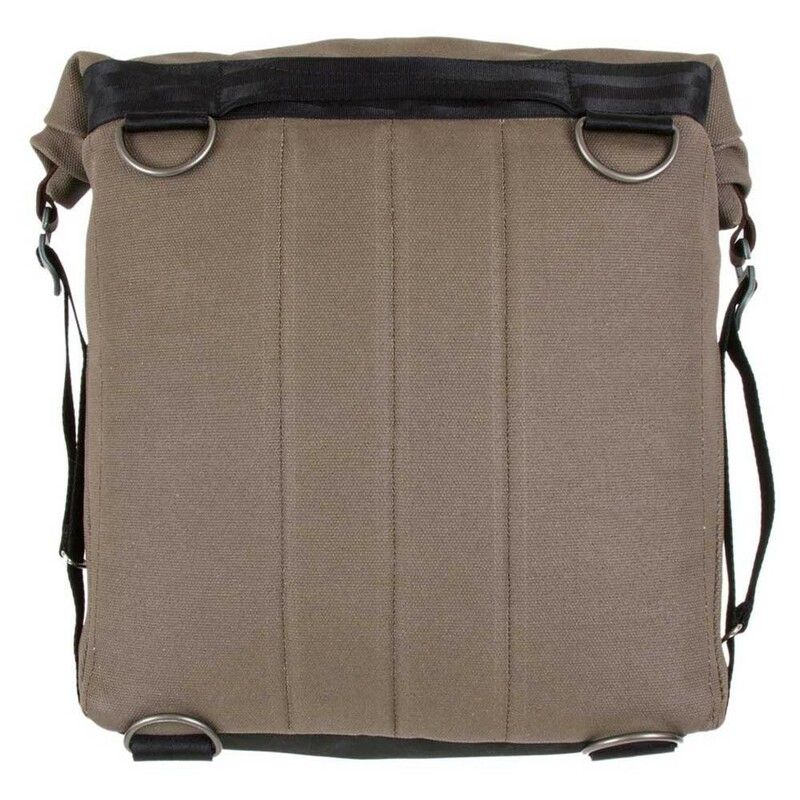 with a full grain leather pocket flap with water-resistant surface treatment. 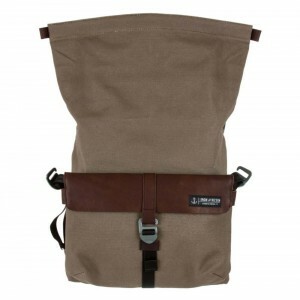 The strap system also means you can fit it to most tubular frames and can be used as a shoulder bag or backpack. The Iron and Resin Terrain II Pannier works best with bikes with a single side exhaust, rear frame and rear shocks or bikes that have exhaust pipes that sit at least 22" below the seat frame. I love Iron and Resin stuff and this is no exception. Quality and build on par with Kreiga. Looks and feels like a premium product. Easy fixing points means you can anchor this as easily to a rack as you can as a pannier. It just works! Yes, the Iron & Resin Pannier will fit this bike. This will fit to the right hand side of an R9T if you're happy to have it tucked below your right leg. We have fitted them using a universal strap looped around the underseat bracket to the frame around the riders footpeg area and then secured below the seat further to the rear of the bike. These panniers are universal and tend to fit most Triumphs really well, the exception being the Bobber models. Please feel free to email us a couple of images at info@the-cafe-racer.com of your bike and we can do our best to make sure it'll fit. 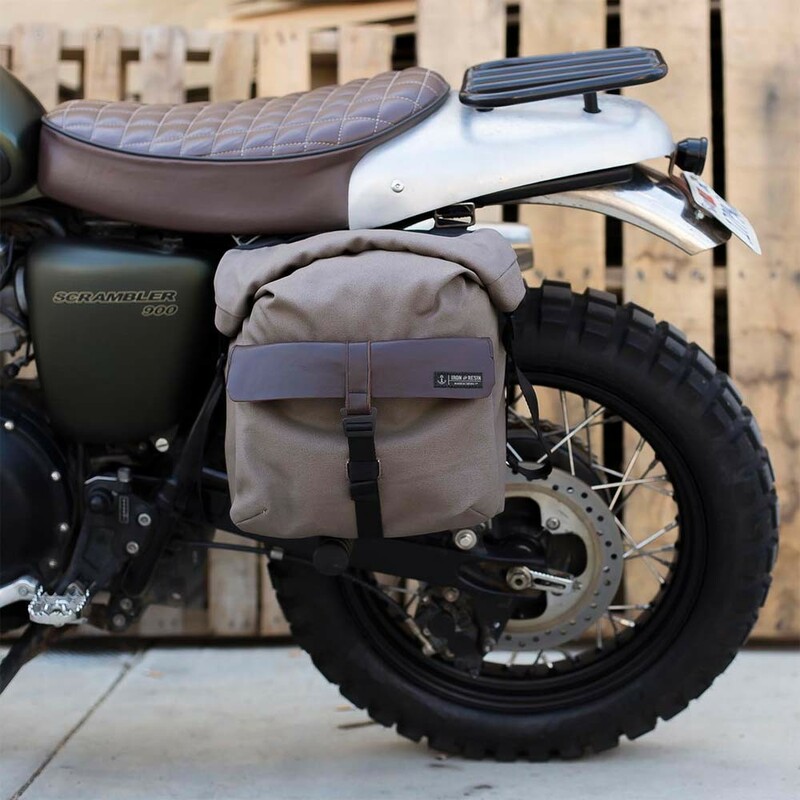 I have been running the original Terrain Pannier for nearly 2 years on my Bonneville T100. 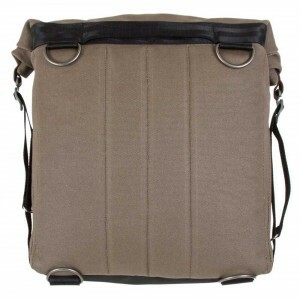 This bag is slightly shorter than the current one, but of similar build I believe. My bag rests on the pillion foot peg and just brushes against my Toga exhaust. The bag has not suffered any ill effects from heat (which is not terribly hot at that point on the pipe). 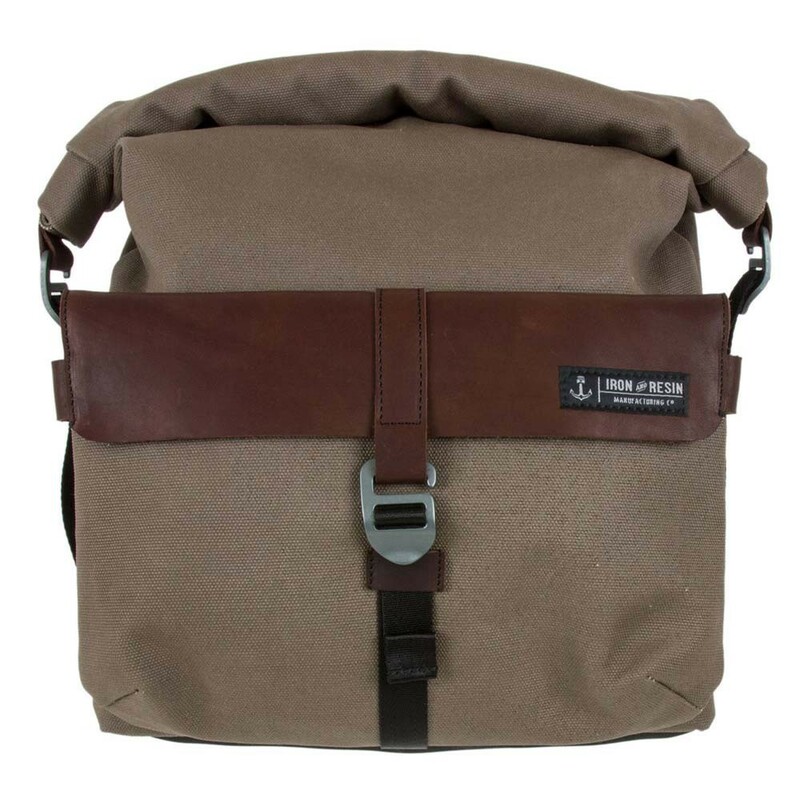 Very pleased with the bag and it's awesome utility. Managed to get this on my Guzzi V7. I noted review from Samuel and was surprised how easy it was to fit...I'm not great with instructions...really impressed with quality and the way it looks. I have low pipes so may invest in another for the other side. So chuffed I found these on your site as I had been looking all over the place and everyone was out of stock. 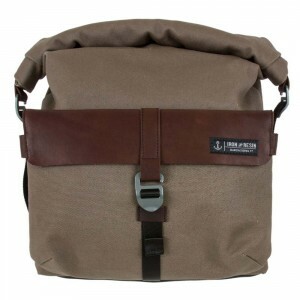 I've just done to weekends away with two panniers and a small rucksack and there's plenty of room and they look so cool! Thanks for getting them to me so quickly for my first trip of the summer. Got two for my Triumph Bonneville. No too fiddly to fit and look great. I ordered these at 2pm on Thursday and they were at my office by 10am the next morning. Amazing service TCR! Bike Model : Bonneville T100 2014, Stock Exhaust & Saddle. 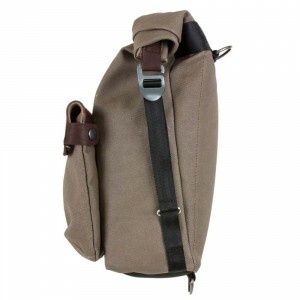 This bag definitively looks amazing, feels sturdy and reliable. I love it. Now.. The installation is not "that" easy on a Bonneville T100. I do not understand why the bottom of the pannier is made of plastic. That is probably the stupidest idea for a motorcycle pannier because, exhausts. For a single rider, attach the straps under your saddle, fiddle with it a bit a third one to the frame, finished, good to go. Now, if you want to have a pillion passenger, you will need to push the bag far back (its easiest set up covers the pillion footrests). Then clearly it has not been designed for it. Though it is perfectly doable. I just rode 300 miles with it and a pillion. So 4/5 stars for the style, the quality, the somewhat easy set up, and a big bad star taken off for the plastic bottom. Will probably buy a second one.